The HTML <canvas> element has a getContext(type) method that takes a string parameter identify a context type (e.g. "2d" or "webgl") and returns a context object of that type. The string parameter was introduced as an extension point to make it easier to add new context types. Of course we're stuck with getContext now for Web compatibility. The reason I mention this is because from time to time I see people trying to use getContext() as a model for extensibility in other Web APIs. Don't do that. Actually, most of the time when I see someone trying to use getContext() as a model, they're using it because they think it gives them an escape hatch from the world of Web standards. They seem to think that it would be OK to pass in vendor-specific strings, get back vendor-specific objects, and never specify or even document the behavior of those objects. This is incorrect. It's no more acceptable to have permanently non-standard Web APIs accessed through vendor-specific strings than it would be to have them accessible through vendor-specific attributes. I tried a few approaches but tonight I finally found a successful one. I made a Windows full memory dump of the errant Firefox process, and attached to it with WinDbg. In the still-running Firefox process I then used about:ccdump to identify the address of the leaking DOM object. I was then able to use WinDbg's "s" command to search the entire memory space for occurrences of that address. Then I had to identify each occurrence. For the references the cycle collector knows about, this is easy: about:ccdump reveals the addresses of the referencing objects so you know those memory areas will contain the address of the leaking object. For other occurrences I had to dig around in nearby memory to figure out what sort of object contained the occurrence. Sometimes it's easy because there's a nearby vtable pointer and WinDbg can tell you which class the vtable pointer belongs to (using the "ln" command). Other cases were trickier. For example I found a reference to the leaking object next to a reference to an XPCNativeWrapper, in what looked like an array of similar pairs, and guessed that this was part of the hash table that maps DOM objects to their JS wrappers. Anyway, I finally identified two references to the leaking DOM object from inside an nsFrameSelection object. These references were buried inside a copy of an nsMouseEvent that nsFrameSelection keeps for obscure reasons --- and did not tell the cycle collector about. Having identified the problem, creating a fix was easy since we don't really need to keep that copy around at all. Hopefully it'll land soon. WinDbg has awful usability but is quite powerful and can do useful things that Visual Studio's debugger can't. I'm a bit fond of it as the distant descendant of DEBUG.COM and SYMDEB.EXE, which I spent a lot of time with while reverse-engineering and patching MS-DOS binaries (i.e., stripping copy protection from games) in my misspent youth. Too bad the syntax hasn't improved over the years! Around this time last year I took my children to the Pinnacles hut and since then I've wanted to take them on a similar trip again. 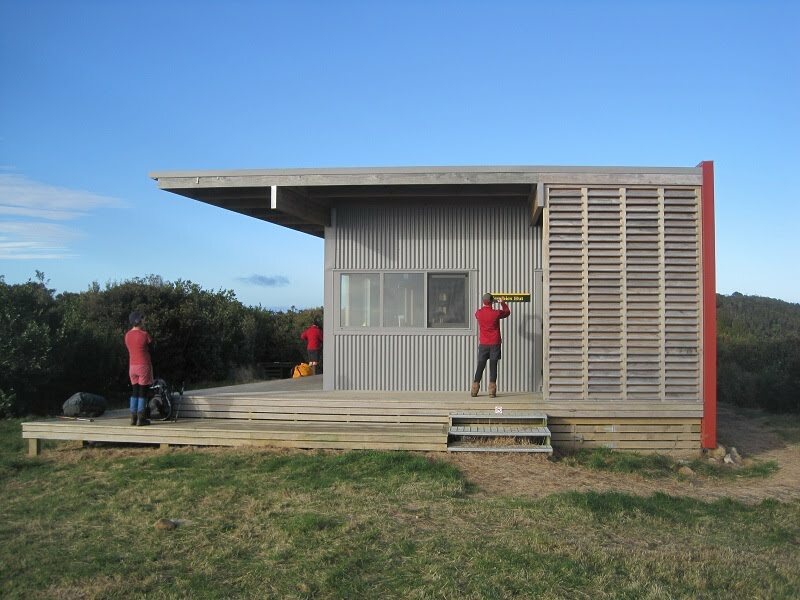 The Auckland region doesn't have many huts suitable for a one-night overnight tramp --- the Waitakere and Hunua Ranges, and Gulf islands, have many good campsites but no huts --- so I set my sights on Crosbie's Hut, in the same general area as the Pinnacles, near Thames on the Coromandel Peninsula. Unfortunately it's been difficult to get away --- weekends have been very busy, or the weather forecast has been poor, or the hut's been fully booked! This weekend we finally made it. We entered at the Tapu-Coroglen Road, a bit more than two hours' drive from Auckland, where a track heads south to meet up with tracks from the coast at Te Puru and Waimoa and then to Crosbie's Clearing and the hut. I chose this route because I thought it might be a little easier to start higher above sea level, and because I thought walking across ridges might be less muddy than going up the valleys. It was still rather muddy! I sank in up to my knee at one point which caused some anxiety in the group. The nominal time from the road to the hut was 4 1/2 hours and we took almost exactly that each way. It's very much a tramping track, not a walking track and there's a lot of up-and-down. We had a wonderful time. The weather was great, mostly very clear, and the hut is quite new and very well designed. The trampers arriving before us had started up the hut's wood-burning heating stove which was much appreciated. The view from the hut is superb and omnidirectional. 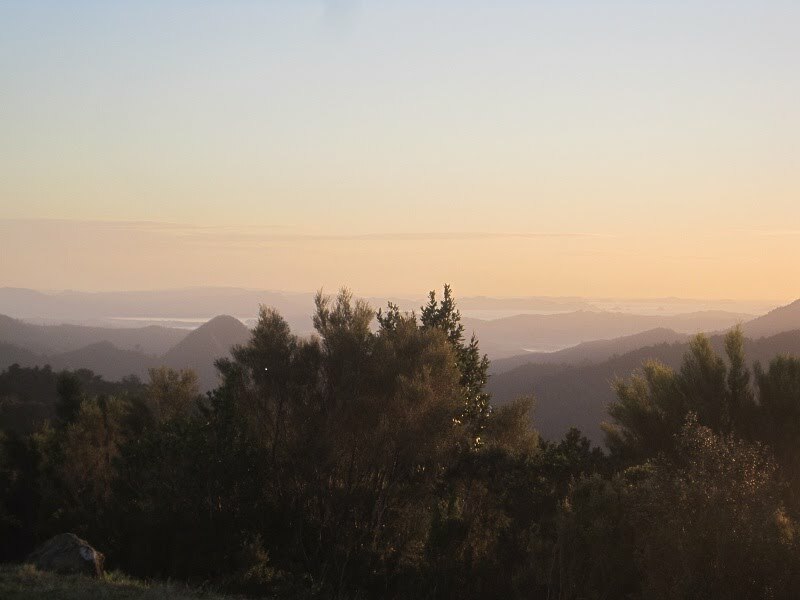 To the west you can see the Firth Of Thames, to the east Whitianga and the Pacific Ocean. The night sky was scintillating. The other trampers at Crosbie's were all very experienced so I asked them a few questions. Most huts collect rainwater in tanks, and the Department of Conservation officially encourages people to boil or treat water used for drinking, but I haven't seen anyone do that yet. One guy I asked said he's never treated water at any of the DoC huts he's stayed at (even when taking it from a stream) and nothing's happened to me yet". Hmm.